Resin, metals, beads, wire, photographs, paper. Art has always been a huge part of my life in some form or another. Growing up in Ohio, my grandmother and I would do different projects that we would sell at community craft shows and for the holidays. When I went off to college, I was encouraged to pursue a degree in something art related, but I fought against that idea and instead obtained a Bachelor's degree in Counseling Psychology with a minor in Intercultural Studies. After finishing undergrad in 2012, I moved to Atlanta to work with an international non-profit, all the while having people encouragingly push me to do something more public in the art field. In 2014 I started a Master's program in Marriage and Family Therapy and started creating jewelry as a way to unwind while studying, giving it to family and friends. And in the Summer of 2015 I finally gave in and started selling my jewelry publicly as Peachy Buckeye Designs! The root of each design is a story. Each piece created is thought up with a person I have met in mind. Almost everything I do in life involves people, and with that I have the opportunity to hear stories that represent so many different views and life experiences. Creating a small token is my way to share some of these stories with people around me. Several design themes that branch out relate to travel, culture, and coffee. One of the hopes I have with my art is to be able to utilize it in a counseling setting to help others share their stories through something they can create! One could argue that the human form is the most incredible masterpiece ever created. Each is exquisite and unique. Our bodies are both what link us together, and what separates us from each other. Every thing we experience in life is through our bodies in some way. In order to interpret new experiences, we relate back to our bodies as a touchstone for our understanding the world. The more we are disconnected with our bodies the more we rely on society to tell us how we feel and what we want. Magdalena O’Connor is a talented versatile artist with a passion for body art. Trained as a special effects and makeup artist she has been Bodypainting for 10 years and has won multiple awards at prestigious Bodypainting events such as the World Body Painting Festival (Austria) and the New Zealand Body Art Awards (New Zealand) over the years she has trained with many of the masters in the field as well as refining in and developing new techniques within this exciting medium. 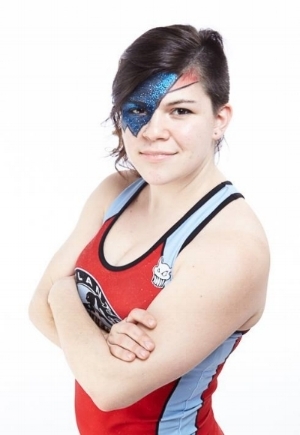 As well as body art, Magdalena excels as a sculptor and prop maker. artists including Kiki Smith and assisted with numerous large scale public installation works such as, Jon Christie’s and Caroline Madden’s Lyrical Light, held at the Times Union Center in Jacksonville Florida. In the years of 2009-2011, Nardi worked as a glassblowing assistant to renowned glass artist, Richard Jolley, in Knoxville, TN. In 2011, Nardi moved back to his roots to pursue his dream of making unique hand-blown glass art. 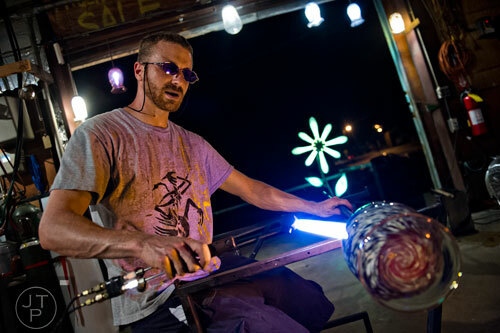 He is owner and operator of Decatur Glassblowing located on the east side of Atlanta. His primary artistic expression is the abstraction of natural form which can be seen in all of his work, whether sculptural, decorative, or functional. There is no better way to share love but through a common interest. Everyone is born an artist, they just need someone to push it out of them. I have received my BFA in Interior Architecture at Savannah College of Art and Design. I have always enjoyed the sense of touch and how things feel physically and environmentally in a space. Ceramics and other forms of three dimensional art has always captured my attention and hands. The fact that I can touch the Earth and create art from something as simple as dirt or trash has always fascinated me. This led to my education in the interiors. Not only am I able to build on a large scale, but I am able to give life to an once empty space. Currently I am designing hotels, yet still working on my sculptures in my free time. The theme for my current collection has been nature and mankind combined into one form. Art heals and art builds relationship. It is both personal and universal. Everyone needs to be able to utilize the peace and power of creation. And it is my vocation to share. As a kid I really liked to break stuff. When I chose to get a degree in art at Valdosta State University, I discovered a way of gathering brokenness to create something whole. I see division in the world and my aim is to bring it back together. I do that physically, through art, using an array of different materials. But I also combat division in community; facilitating gatherings where art brings people together to build relationship, reconcile, and goof off. The first time I heard about Paint Love was a few years ago while I was still finishing up my BFA in Sculpture. There was an opportunity to bring the experience of foundry to a great group of kids. They had been collecting aluminum cans for weeks and possibly months to help us collect enough metal to melt down so they could make their own relief sculptures. As an artist, it was so much fun to see a group of kids find joy in the same medium that you do. It was my first time sharing that experience with a younger generation and I didn't expect for it to be as rewarding as it was. Being able to feel the energy that radiated from the kids during that experience, is what keeps me volunteering for the arts. I graduated with my BFA in Sculpture from the Savannah College of Art and Design utilizing both the Savannah and Atlanta campuses. The move from Savannah to Atlanta influenced my work immensely! I was pushed to keep answering my own questions, to keep figuring out what was driving me to make and create. My influences constantly change but recently I have been interested in exploring the micro and macro structures found in formations created by nature. I am trying to get back into a good rhythm of creating again as I have recently started a full time position at Kennesaw State University in the Architecture department. Working as the Digital Fabrication Technician, I am able to digitally design pieces and bring them into fruition with a number of different materials. Designing my works digitally first has become a main component of my creative process that has allowed me to easily see how specific changes alter the work before I make physical ones. I create because I need to, because my natural equilibrium would be thrown off if I didn't. I've been looking for a creative volunteer opportunity, and Paint Love provided it! I graduated with my BFA in Drawing from The University of Florida. My work tends to be tactile in nature, and explores layering to create a unique surface on which to create. I'm drawn to the idea of family, antiquity, and re-contextualizing mundane subject matter. This means that I frequent antique and thrift stores, collecting discarded family photos and postcards. These two things have been the foundation of a lot of my work. I hope my art continues to provide means of personal expression, as well as a way to touch others, and hopefully opens doors for travel and exploration. How I came to Paint Love sounds a little like an artist fairy tale. It all began under a bridge, with some big dogwood flowers being painted by PL founder Julie. We began discussing her non-profit, and she was looking for a metal artist for her organization's artist family and I fit the bill. The arts are a vital element in who we are are humans. Sadly, many children lack access to opportunities that allow them to explore those key elements. I love the fact that Paint Love provides the bridge between artists and kids in the community who normally miss out on a creative education. I am excited to be able to enrich young brains and equip young hands with skills they can keep for a lifetime. As a feral kid raised between the swamps of North Carolina and the hollers and wilds of the Great Smoky Mountains, Miranda has always had a foot in a creek and her nose in a book­­ all while earnestly conversing with every critter that crossed her path. Learning was always a full contact sport, and growing up she knew she was going to be a scientist, gladiator, or maybe an owl. Constantly echoing in her head was revival hymns and pre­colonial Appalachian tales. The universe was vivid and full of stories. She began to understand this world through the indefatigable ability of her mother­­Who explained things through visual storytelling; delightfully illustrating or constructing a physical accompaniments to the tapestry of stories as explanations for this rich cacophony of culture. She soon found herself creating explanations of the world in a similar manner. It wasn’t enough to doodle out a problem to try to solve it, She needed to build it, to live inside the issue to understand it and find a resolution. Life’s equations and her experiences became monuments to uncovering the unknown. Space became the solution. In her work she shares this type of learning expression with her audience. Driven by the potential for revelation, she seeks to engage the viewer in a moment leading to an epiphany. The finished pieces create a dialogue on the beauty of human experience. Miranda holds multiple degrees in fields ranging from BioChemistry to Fine Art. She received her MFA in sculpture from the Savannah College of Art and Design in 2015.